Face to face with Big Al. While usually - apart that is from the little known giant species like A. amplexus - not in the same size range as T. rex, Allosaurus was an iconic member of the late Jurasisc megafuana, a huge and powerful predator, and clearly a very ecologically successful animal, as it easily outnumbered contemporary megapredators such as Ceratosaurs and Torvosaurus. An adult allosaur combined a flightless bird-like body, physiology, and agility with the brain of a crocodile and the mass of a medium-sized rhino; which means that it would basically lunge at anything that moved and looked like lunch(which basically was any other animal large enough to notice). Camptosaurs, stegosaurs, medium-sized sauropods, even other theropods, there was probably nothing short of a thirty-tonne apatosaur it wouldn't take on. With its powerful jaws and hind limbs, strong grasping forelimbs, and long counterbalancing tail, this impressive yet graceful animal very much typified the large preditor ecotype of the mid-Mesozoic. The above rather melodramatic title is intended as a segue into a discussion on Allosaurus and phylogenetic methodology. 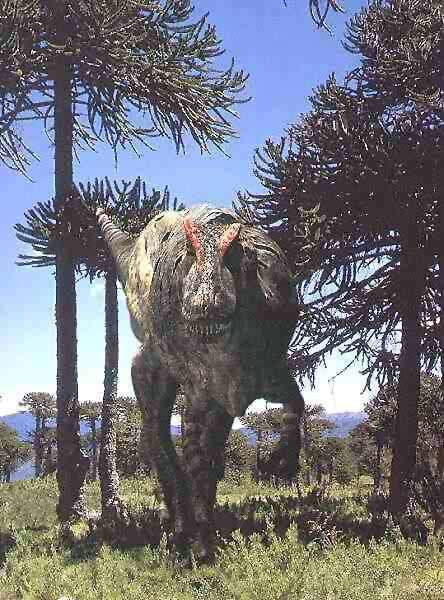 For rthose who don't know, Allosaurus was the dominant megapredator of the late Jurassic (see also above paragraph). Phylogenetic methodology is how we work the evolutionary tree of life on Earth. 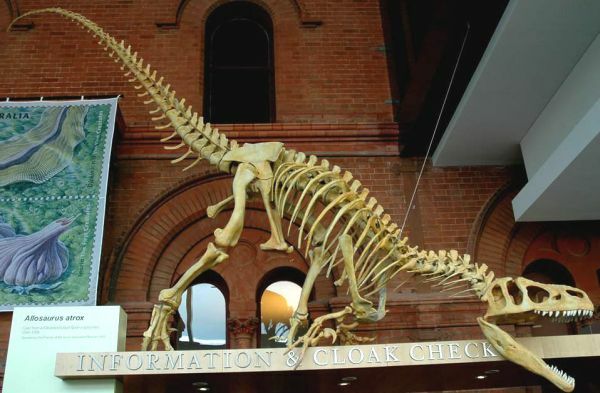 Over the last two decades, a number of different phylogenetic hypotheses (a fancy way of saying "family trees" or "evolutionary relationships") regarding the evolution of the allosaurs have been proposed. One option for example has Sinraptoridae and Carcharodontosauridae as sister groups (sharing a common ancestor), with Allosaurus and Acrocanthosaurus as a side branch (Smith et al 2007). The current tendency however is to have something like Sinraptoridae + (Allosaurus + (Acrocanthosaurus + (higher Carcharodontosaurs)) (e.g. Benson et al, 2010, Eddy & Clarke 2011). This is the phylogeny we have followed here. We can be pretty sure that Allosaurus evolved from something like Sinraptor or one of his cousins, and replaced them as the top carnivores of the Kimmeridgian and Tithonian ages (the latest Jurassic period). The two are pretty similiar in size and appearance and no doubt lifestyle, and differ only in detail, however Allosaurus has some advanced minor features not found in early or more primitive texa, as revealed in details of the skeleton (doubtless there were physiological and soft tissue details as well). Morphologically (in terms of the evolution of form) as well as stratigraphically (the sequence in deep time revealed by fossil remains), Allosaurus represents the non-missing link between the Middle Jurassic Sinraptorids and the Cretaceous Carcharodontosaurs. If sinraptorids and equivalent taxa, such as Lourinhanosaurus, constituted the first pulse of allosauroidean evolution, then Allosaurus (or Allosaurines) were the second, and the dual Cretaceous adaptive radiations of giant carcharodontosaurs and medium-sized megaraptorans the third and culminating one. Here as elsewhere, the fossil record reveals the evolutionary history of life on Earth as beautiful sequence of transformation of form, with one type evolving into or being replaced by another through the course of deep time. While some more fastidious phylogenetists might not want to state hypotheses too literally, citing the incompleteness of the fossil record as a reason to avoid statements about transitional forms or identification of any known taxa as actual objective (rather than hypothetical and abstract) ancestors, or rejecting the premise that cladograms provide insight into evolution in deep time, we would rather avoid such phylopessimism and adopt a more concrete and optimistic approach. We affirm that stratigraphy and the fossil record provide a strong phylogenetic signal which helps reveal details ofthe evolutionary tree of life. This raises the problem of how such dendrograms should be drawn. Dendrograms such as the ones we employ here are not as strict or rigorous as cladograms, but they do provide popular representations of them (and are often confused with them). Cladistic methodology is - unlike evoluitionary systematics - not concerned with describing actual common ancestors; cladograms are simply abstract diagrams for conveying phylogenetic hypotheses, generally arrived at through statistical parsimony analysis. 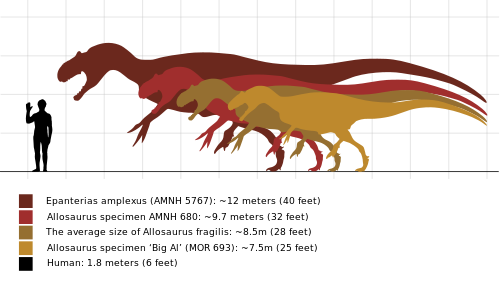 In such a diagram, Allosaurus might be shown on one terminal node, Sinraptor on another, and so on, without any comment as to whether one is the actual ancestor of the other. We say that Sinraptor is placed in a more basal position (as we have done here), but that doesn't make it an ancestor in cladistic formalism. Formalism can lead to problems though. When popular adaptions of such cladograms are drawn online (i.e. dendrograms), it may seem that all the species assigned to a clade appear as a distinct and quite dramatic evolutionary radiation, as in Mikko's Phylogeny, Wikipedia dendrograms, or the Theropod Database, when all that is being done is representing sister-group relationships in simple diagramatic format. 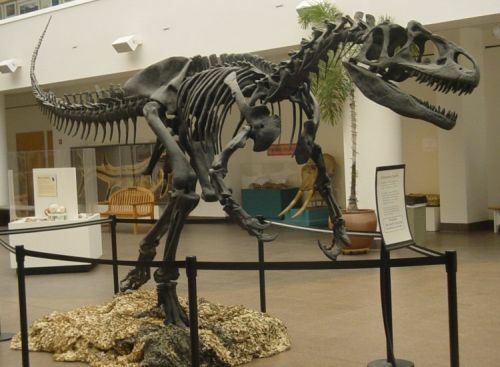 (scroll down for Allosaurus on the Theropod Database link). This is where Pattern Cladists get it right; such hypotheses should not be intended as literal geneologies. The problem is, at this poor level of resolution, it is often very difficult to know which species gave rise to which. So they tend to bunch into artificially monophyletic clusters (we saw this with groups like Ceratosauria and Ceolophysoidea). And even if (using here the linnaean genus and species hierarchy) a genus (a group of species) is ancestral to a later group (i.e. one of the species, known or unknown, in that genus directly evolved by Darwinian means into subsequent species, genera, and/or clades) traditional cladistics does not allow this to be represented (because it is only concerned with sister relationships, not ancestors and descendents). Now, since Allosaurus is the only large advanced avetheropod known from the latest Jurassic, and assuming the phylogenetic hypothesis Sinraptoridae + (Allosaurus + (Neovenator + (Carcharodontosauridae + Megaptora)) or similar (e.g. (Carcharodontosauridae + (Neovenator + Megaptora))), it would be a paraphyletic taxon ( grade). Even if we don't know which species of Allosaurus gave rise (via speciation) to the lineage culminating in early Cretaceous forms, it would still have been one of the species (or more than one, if they form a series), even if it is not one currently known to science, or even one that never fossilised. The one on the left is a version of the type found everywhere online, which is based on a sort of cladistic literalism; as common ancestors are not referenced, we have instead a ghost lineage alongside a brief-flowering but ultimately sterile Allosaurus clade. The one on the right however is based on the premise that Allosaurus is a paraphyletic taxon, i.e. that it is the actual ancestor of Cretaceous allosauroidea. Of course, this still could be refuted if another advanced and intermediate late Jurassic taxon is found (in which case that taxon becomes the new transitional, paraphyletic grade), but on the basis of current knowledge. For this reason, we're introducinga new method of drawing dendrograms. At least that goes for the present author, some of the time. Other Palaeos contributers will differ according to whether they are phylogenticists, evolutionary suystematists, evolutionary phylogenetists, stratocladists, or some other methodology or combination of methodologies. Hence there is unlikely to be any rigorous attempt at consistency in these webpages for quite some time, if at all. Technically speaking, "phylogeny" is used by specialists to refer to cladistics and molecular phylogeny, either alone or in combination, whereas "evolutionary systematics" is applied to the pre-cladistic methodology. Since these two methodologies are complementary rather than contradictory, we tend to use these terms synonymously, or even combine them to refer to the need (very rarely acknowledged) for an all-methodology approach. Allosaurus skeleton mounted in the lobby of the San Diego Natural History Museum. Allosaurus > Sinraptor. Padian et al. 1999). Most of the following applies to Allosaurus, the only certain member of the taxon. Up to 12 m for Allosaurus, but * may also include the larger Giganotosaurus (more probably a Carcharodontosaur); skull large but very narrow (indeed the entire animal is extraordinarily narrow in anterior view); skull is largely composed of buttressed arches, rather than plates, except for the nasal-lacrimal shield along the dorsal midline; skull apparently had ability to expand laterally; in Allosaurus, the lacrimal seems remarkably fragile above the orbits and may have been protected by a crest or horn-like structure attached to rugose flanges of the lacrimals on the postero-dorsal margin of the pre-orbital fenestrae. Premaxilla with 5 pairs of teeth; "tooth plates" (modified cingula?) at base of teeth; all tooth plates fused together; posterior end of angular not anterior to articular; unique, neomorphic anarticular bone present; vomers do not contact pterygoid; $ single mandibular fenestra small externally; upper jaw with about 20 teeth, lower jaw with 13; $ deep anterior ramus of surangular; nasal with 1-3 pneumatic openings; dorsolateral horn of lacrimal high; ventral process of lacrimal uniformly convex; lacrimal may contact maxilla externally; small, triangular prefrontal; small rugose anterior projection on post-orbital; $ short quadrate, with head at the level of middle of orbit; separate exit from braincase for opthalmic branch of trigeminal (Vth) nerve; large basal tubera below occiput; paroccipital process turns strongly downward; hyposphene hypantrum articulation present only from 6th dorsal vertebra; caudal vertebrae without hyposphenes; furcula present; sacrum massive; manus bears 3 strongly recurved unguals, although arm is short and slender; brevis shelf narrow; pubic boot is very prominent; $ pubic boot longer anteriorly than posteriorly & triangular in ventral view; ribs and distal elements of hind limb are oddly delicate and slender; tall ascending process of astragalus; astragalus lacks extensive contact with fibula. An important and highly successful group of species, known so far from North America, Europe, and probably also Africa. Doubtless the only reason they aren't found more widely would be absense of knowledge of other latest Jurassic faunas. They were the classic large dinosaurian predators, generally about 7 to 8 meters long and over a tonne in weight, and retained the strong forearms of their megalosaurian ancestors. Apart from a few holdovers like Ceratosaurus and Torvosaurus, which occured with Allosaurus in Europe as well as America (Mateus et al 2006), allosaurs dominated the large theropod niche for some ten million or so years. All these animals, and many otehrs, were a victim of the end Jurassic extinction event, which brought about the end of the familiar Jurassic ecosystem with its allosaurs, coelurids, stegosaurs, diplodocids, and camarasaurs (the brachiosaurs however were among the few groups unaffected). At one time the family Allosauridae included such diverse taxa as Allosaurus, Neovenator, and Acrocanthosaurus, and even all of the Carcharodontosaurs, as well as the poorly known Valdoraptor, Wakinosaurus and "Chilantaisaurus maortuensis." Nowadays everything apart from Allosaurus (and probably synonyms such as Saurophaganax) are placed in other families, specifically the Carcharodontosauridae. Unless giant forms such as Epanterias et al are given their own generic name, Allosaurus would have to revert to its senior synonym of Antrodemus, because there would then only be one genus of large Morrison carnosaur, and Antrodemus would no longer be indeterminate (such are the rules of scientific nomenclature). This would be the same situation as Triceratops and Torosaurus being renamed Agathaumas should they all turn out to be part of a single growth series. Currie & Carpenter (2000); Currie & Zhao (1993) . The type species of Allosaurus. The number of species assigned to this genus is controversial (Wikipedia, but in view of great temporal range of the Morrison formation, it is quite possible that the remains assigned to A. fragilis don't all pertain to one species. We have however followed Gregory Paul in distinguishing this second species. As defined here, A. fragilis is known from one good skeleton, various skull and postcrania. It is therefore much rarer than A. atrox (making it unlikely the differences are due to sexual dimorphism), has taller, more pointed horns just above the eyes, and seems to have a more slender build, especially in the neck and forelimbs. In relation to A. atrox the head is shorter, deeper, and subtriangular. According to Robert Bakker it also occurs in earlier strata (the Garden Park and other quarries of the lower Morrison formation), so it may be an ancestor of A. atrox. "A. jimmadseni" may be a juvenile of this species or a distinct, primitive form. It is based on a nearly complete skeleton and skull. Allosaurus atrox in dynamic pose - cast from a Cleveland-Lloyd Quarry specimen. South Australian Museum public display (Adelaide, South Australia). Usually considered a synonym of A. fragilis, A. atrox has been suggested by Bob Bakker and Gregory Paul as a second valid species, but its status remains unclear. It is distinguished by a longer, shallower, and more subrectangular skull. A specimen from the the late Kimmeridgian-early Tithonian of Portugal may also belong here, or it may be a closley related species or subspecies. This was a common animal - complete and many partial skulls, many partial and complete skeletons - and seems to have replaced the earlier A.fragilis. The Cleveland-Lloyd quarry contains the disarticulated remains of over sixty individuals; peresumably this was a preditor trap, like the Pleistocene La Brea tar pits. Allosaurus lengths have been measured along the vertebral column. MOR 693 scaled using the scale bar in Hartman's Reconstruction. Average size 8.5m based on Glut 1997. Allosaurus AMNH 680 and Epanterias estimates based on Mortimer 2003. Madsen (1976) estimated Epanterias at 13m. (Madsen1976/1993). Skull of Allosaurus europaeus in left lateral view, from Vale Frades, Porto Novo Member of the Lourinhã Formation, Portugal. The illustration is based on the two sides of the skull. Allosaurus tendagurensis tibia, Naturkunde Museum Berlin. Known only from a single limb bone, this huge theropod is too fragmentary to be classified with certainty. From Wikipedia A. tendagurensis was named in 1925 by Werner Janensch for a partial shin (HM 67) found in the Kimmeridgian-age rocks of Tendaguru, in Mtwara, Tanzania. This species has not had strong support in recent years, with opinions on its identity ranging from a tentatively valid species of Allosaurus, to a basal tetanuran, to simply a dubious theropod. One recent analysis has placed it in Carcharodontosauridae. - Wikipedia. If this species is a carcharodontosaur it would be the only Jurassic member of the group, and show a Gondwanan origin, similar to the titanosaur sauropods. But similarities could also be convergences due to large size (especially as early carcharodontosaurs like Neovenator were only modestly proportioned). For now we have tentatively retained it in Allosaurus (Barosaurus, Dryosaurus, and Elaphrosaurus are other genera known from both continents, although the African brachiosaurs beloings to a distinct genus (Giraffatitan) from the North American form). Of course, the genus Allosaurus itslef could be a paraphyletic/ancestral taxon, from which all Cretaceous carnosaurs evolved.